New and Used Boats For Sale! Sell and Buy a Boat on Boats24.com - The Ultimate Platform for Advertising Boats and Yachts For Sale! New and Used Boats For Sale – Boats24.com! Boats24.com is the ultimate online marketplace with classified boat advertisements, perfect for those looking to sell or buy a boat for sale. Whether you are looking to buy new boats for sale or searching the used yachts, you will find an easy and friendly service from the Boats24.com team based in Hamburg! Among the boats and yachts for sale will be something for all budgets. The boat classifieds have all forms of boat for sale – from motorboats and sailing boats to an extensive selection of sub-categories that includes both houseboats and fishing boats for sale for sale! As well as the boat sales; with boat trailers, boat engines, berths and even boating equipment to peruse, you are guaranteed to find everything you need. All boat lovers can exploit the amazing offers available from the boat dealers and private vendors who advertise their new or second hand boats. With a plethora of used boat dealers itching to offload their used yachts and used sailing boats at a great price, it is well worth the time scouring the website to find that fantastic deal! If, like many of our users, you already have a particular manufacturer or model in mind and have your heart set on buying it, we recommend you search by brand. All of the world’s most well-known manufacturers have their boats advertised on Boats24.com! Be it Beneteau, Bayliner, Jeanneau or Princess Yachts, there are quality boats for sale, so why not unearth your dream vessel? The sheer number of high quality yachts for sale makes Boats24.com the perfect place to buy boats and start enjoying the water! Motorboats – From Speed Boats to Motor Yachts! Coming in all shapes and sizes, why not buy a boat that can deliver some real power? There are smaller motorboats such as cabin cruisers available on Boats24.com as well as gigantic luxury motor yachts that are sure to impress! When looking to buy boats, some thrill-seekers are all about the need for speed. If you belong to this select group, race on over and look at our speed boats for sale! 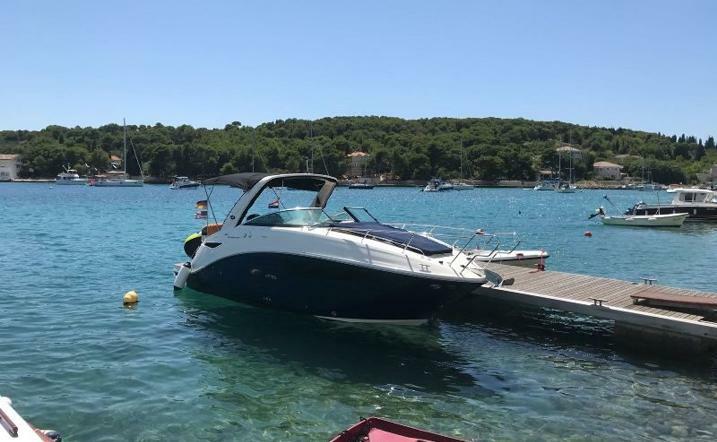 There are new boats for sale as well as used boats for sale in this wide-ranging category, and with renowned manufacturers such as Sunseeker, Sealine and Nimbus Boats gracing our website, you will be sure to find the ideal boats, used or new, for you. Sailing Boats: Used Yacht or Colossal Catamaran? Also available in innumerable sizes are sailing boats, probably the most popular vessels to take to water. The extensive sailing boat sales on Boats24.com offer many types of used yachts for sale right across Europe, be it a cutter, ketch, schooner, sloop or yawl. Before someone makes a pun about a boat sail and a boat sale, why not browse the beautiful Cruisers, Catamarans and Sailing Yachts, as well as the other forms of sailing boat in sales on this extensive online marketplace! You will find new and used sailing boats for sale from all of the big sailing and yacht manufacturers, inter alia, the magnificent models available from Dufour and Hallberg-Rassy! Jet-Skis and Small Boats For Sale! We are proud to say that our boat classifieds include items for those with specific interests. For our thrill-seeking visitors, our assortment of 1-seater, 2-seater and 3-seater Jet-Skis will satisfy that need! A Jet-Ski is a form of PWC (Personal Water Craft) manufactured by Kawasaki and is one of the most popular adrenaline-fuelled ways to do water sports! There are also quieter and more relaxing ways to enjoy the water. With our selection of small boats for sale from the new and used boat dealers on Boats24.com you are able to go kayaking, canoeing and rowing – just to name three! Browse the small boats, including some trawlers, dinghies and even the odd row boat on sale. The fantastic service and great offers on second hand boats allow those from all backgrounds and all budgets to try and experience something new. Inflatable Boats, Boat Trailers, Boat Engines, Boat Equipment or Berths and Moorings – Everything you’ll need! Regardless of what your boating passion is, Boats24.com is the place to be. If you are looking to buy an inflatable boat or a dinghy, there is an incredible choice on offer – especially amongst the RIBs (Rigid-hulled Inflatable Boats) for sale. Additionally, whether you are sailing, cruising, fishing or trawling, you can buy or rent berths and moorings in marinas, harbours and ports all over the world! If you aren’t looking for moorings or berths, but something on land, then Boats24.com can help you there too! For safe and secure boat transportation, we have many different boat trailers for sale that can transport boats of all shapes and sizes! In addition, Boats24.com has a plethora of boat and water sports equipment such as fenders, compasses, towing lines, sea charts and life jackets, as well as a wide range of boat accessories. Last but not least, make sure you don’t forget to browse our diverse assortment of boat engines, choosing from the outboard engines, inboard boat engines and electric motors on offer! Sell Boats & Buy Boats – Do you have boats for sale? As a boat dealer or private vendor, with Boats24.com you have the unique opportunity to advertise your new or used boats and yachts – be it Fairline or Quicksilver Boats – as well as your boat trailers, your boat equipment and your berths or moorings cheaply and cost-effectively. Provide boat traders and those second hand boat buyers with extensive information and high-quality images to encourage the boat’s sale and benefit from Boats24.com’s extensive marketing campaigns. Sell boats, boat engines, boat equipment or your boat accessories quickly and easily on a website many potential buyers visit first! Sell Boats For Sale – Safely and Securely! Customer satisfaction is our utmost priority. At Boats24.com we ensure that fraudulent behaviour is minimised in boat sales. Please browse all the new and used boats available in the peace of mind that we are a professional and experienced online boat marketplace. The selection of new and used boats for sale are waiting! From everyone at Boats24.com, we wish you all the best – whether buying or selling your boat!